This article aims to list and regularly update the base salaries at Indian law firms, in-house legal functions and other employers of Indian lawyers. 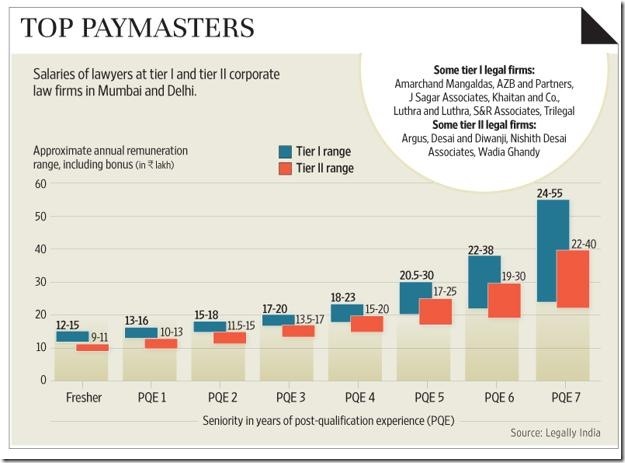 More detailed information on later salaries at law firms was published by Legally India in 2012 after analysing salary survey data in detail. In 2016 we published a compilation of 4 Indian recruiters' law firm salary data. Please update with any information or data you have or send Legally India an email with figures confidentially. Finsec Law Advisers 10 Performance based bonus. Argus Partners 8 10 with bonus at fresher level. Nishith Desai Associates 7.2 (salary) +4.8 fixed amount is paid out after three years with firm. First-year CTC* figure therefore 12.12 forms base for 2nd year increase. Source: Legally India research: interviews with students and college recruitment committees and putting those figures to law firm or organisation for correction or comment. *CTC: "cost to company" figure can include other benefits than just base salary. This page was last edited on 7 December 2018, at 06:01.